reset(): This function initializes the timer and starts the elapsed time counter. getElapsedTime(): Returns the number of seconds since the timer was created or the last reset (whichever is more recent). This example demonstrates a simple timer. It displays the number of seconds the page has been running. The timer can be reset with the (cleverly named) Reset Timer button. Create a variable for the timer. This should be getting familiar. All the interesting elements are objects, and the timer is no exception. 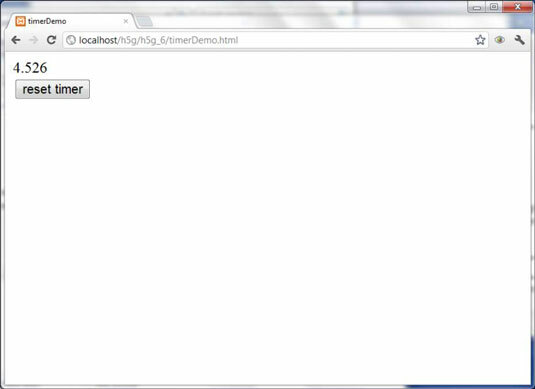 Create a variable called timer that will be an object of type Timer. Be sure the timer starts out at zero. Get the elapsed time in every frame. In the update() function, call the timer’s getElapsedTime() method to find out how much time has passed and copy this value to the output area. Reset the timer when the user presses the button. When the user presses the reset button, call the timer’s reset() method to reset the elapsed time back to zero. This program uses the main loop from simpleGame, but it doesn’t really need to display the scene. For this reason, the Scene object has a hide() method. You can also display the scene later with its show() method.